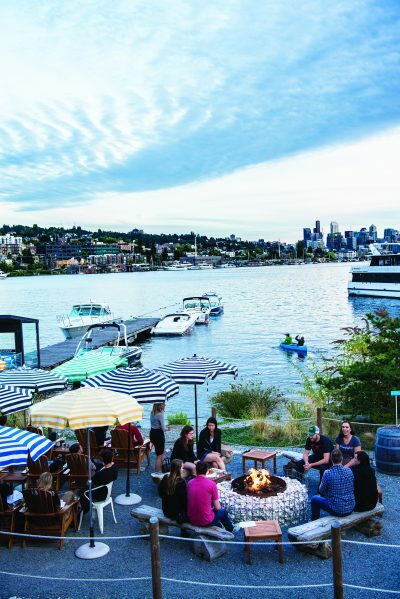 Our unparalleled summer season means Seattle bars take alfresco drinking very seriously. Consider the patio at Hawaiian-fusion haven Marination ma kai (*1660 Harbor Ave SW; marinationmobile.com) on Alki, for instance, with its jaw-dropping skyline panorama, beer garden vibe, vivid umbrellas, and convivial picnic benches—all just a quick water taxi ride from the downtown waterfront. The new buildings going up in the city center and South Lake Union have given rise to some stunning rooftop spaces, a relatively new phenomenon in this growing city: The Nest (*110 Stewart St; thompsonhotels.com), the bar atop the new Thompson Hotel offers a rare bird’s-eye view of Pike Place Market across the street, not to mention upscale cocktails with names inspired by our feathered friends. The outdoor area up here is a bustling scene on summer nights, but the cozy indoor space is welcoming even in nippy fall. 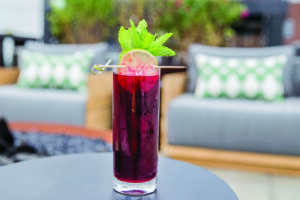 Another new building, the 400 Fairview in South Lake Union, boasts watery vistas, firepits, and cocktails at rooftop restaurant Mbar (400 Fairview Ave N; mbarseattle.com), plus a menu by Jason Stratton, Top Chef alum and one of the town’s most accomplished chefs. On the ground floor, the Maine-inspired watering hole Bar Harbor (400 Fairview Ave N; barharborbar.com) also serves drinks and oysters on an ample covered patio, meaning alfresco drinks can still happen in the rain. 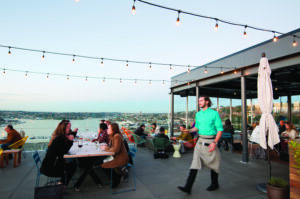 On Lake Union’s northern shore, the gently Mediterranean restaurant Westward (*2501 N Northlake Way; westwardseattle.com) lines up Adirondack chairs along the shore and around a firepit built with oyster shells, so you can have a glass of wine and watch boats motor past against the skyline. Not that all our patios involve bodies of water. On Capitol Hill, neighborhood gem Monsoon (615 19th Ave E; monsoonrestaurants.com) serves modern Vietnamese fare in its dining room and hides an idyllic patio, loungey seats, and taps dispensing beer, wine, and even draft cocktails on its roof—all concealed from the sidewalk below by a leafy shroud of trees. Seattle’s summer nights invite lingering outside into the evening—the proper setting helps you savor every one.